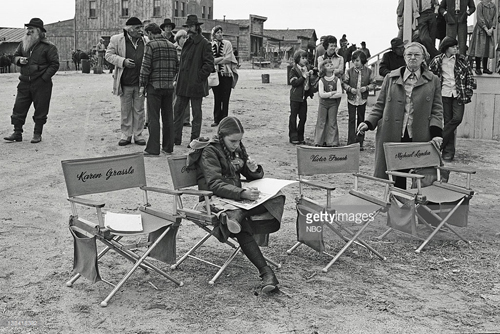 Melissa Gilbert on the set of “Gold Country.” I think she’s coloring in a coloring book. Love the way she’s sitting. So confident! 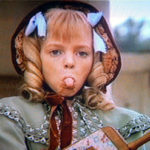 I get a sick feeling in my stomach whenever the Ingalls leave town. Nothing ever good comes from it. Going through Deadwood for the Ingalls must have been like me walking through Amsterdam’s Red Light District with jet lag. But I at least I got to eat a hash brownie to take the edge off. Boy there sure are a lot of cowboys in this episode! I wonder if Landon would call up his old Bonanza buddies and say “Let’s party like it’s 1959!” More than likely he was just a very decent man who called up actors he’d worked with and say “Do you need some work?” It seemed like every cowboy actor and stuntman ever was called up for this episode. And the foley sound is especially awesome with all the whooping and shooting. Here’s a bit of a tangent – Poor Jack! Couldn’t he ride in the covered wagon too? That was a damned long journey. Give a dog a break man. I always rejoice when Edwards falls off the wagon and gets to sin a bit. As a drinker and a sinner myself I approve of his behavior most of the time. Grace seems like she always has the leash on too tight. “You call this having a little fun?” she remarks as a post-coital man stumbles down some whorehouse stairs and drunkenly fires his pistol (yes gun) in joy. The epic naivéte of all of the characters really makes me pound my forehead sometimes. I don’t know why they didn’t keep their claims secret. It’s mind boggling. This seems like a particularly dark episode what with the self-immolation and grave robbing. Or is it just me? 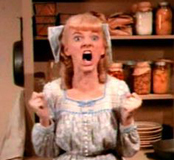 By the way I had to look up what the Ingalls’ $126.00 find would be worth in 2015 dollars. That would be approximately $3585. It seems like that would definitely keep the Ingalls happy for at least a year. History buffs will also be happy to hear that there was a real life South Dakota Gold Rush right around the time that the Little House stories take place. Of course another TV show, Deadwood is all about that. 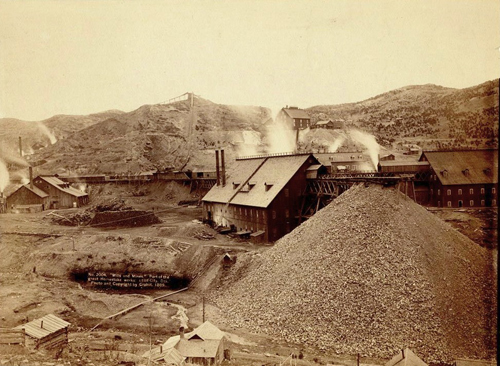 The Homestake Works Mine in 1889 in Leads, South Dakota. No small operation! It ain’t just you, Tracy. This pair of episodes is as dark as the Dark Side. I could not sleep after watching these! Another nightmare straight from Landon’s unconscious featuring, as Tracy said, murder, self-immolation, mental illness, grave robbing, possible necrophilia and greed. How can Laura, Mary and Carrie mosey down a hill full of wildflowers before and after these atrocities? Agree as well about the minister. 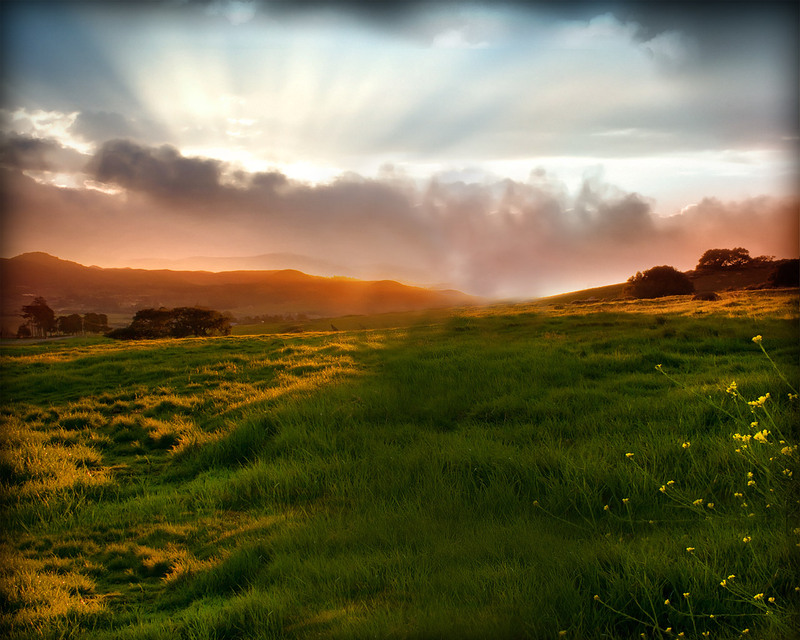 His forehead was big as a flying saucer and his eyes were wet and glassy. Icky! Adding to the feeling of an alternate universe in these episodes was the sideways rain with sun shining through in Walnut Grove before the Ingalls leave to head west. Pretty tough to film a rainy day in southern California. Industrial Light and Magic, you’ve done it again – badly. We gotta give some credit for art direction and makeup in these episodes. The crazy, romantic, doomed coot (Harlan, played by Robert Forward) has a cool little lean-to and his face looks so sun blistered he seems otherworldly. Now pardon me, I’m off to my Little House-induced shrink appointment!